Warning: if you’re driving right now, you may be breaking the law. On Tuesday, following the growing trend of State driving-while-texting bans, the U.S. Department of Transportation has immediately banned bus and commercial truck drivers from texting while behind the wheel (click here for an up-to-date, interactive map of state-by-state texting laws from the IIHS). And if you’re reading this post on the road–bookmark it and read it later, because some States ban data-entry in general, not just texting (good thing there are no free, robust legal research iPhone apps out there—that would be really tempting). 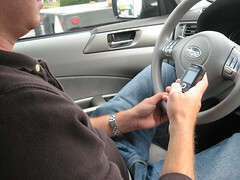 According to the DOT, research shows that folks who drive and text are some 20 times more likely to get in an accident. Despite clear signs from research (and lots of anecdotal evidence) that multi-tasking while driving is downright dangerous, it’s one bad habit that’s harder to drop than…well, a phone call. Know the law and be safe—the last thing you want is a wake-up call in the form of an accident.